Travel Guide Ferari Mon: Tinchuley, Derjeeling, Your ultimate holiday destination. Tinchuley, Derjeeling, Your ultimate holiday destination. Tinchuley : Tinchuley is 32kms from Darjeeling, 73kms from NJP, 77kms from Bagdogra and 35 km from Kalimpong and 3 km from Thakda Your ultimate holiday destination. Tinchuley is a small mountain village in Darjeeling district. Tinchuley is an offbeat hamlet situated close to the West Bengal-Sikkim border. The word Tinchuley means Three Ovens (Tin Chullas). This such name to the village has been given because of the three prominent hilltops that surround the place and which from far look like Ovens or Chullas. It's a developing tourism place. In fact, the organization World Wide Federation has been actively assisting some 17 families here to develop a model organic village and promote village tourism. If you love nature, the lovely views of the Himalayan range, like to see the Teesta flow through the mountain landscapes, enjoy tea gardens, orange orchards, walking along village trails, watching birds, local culture, people and food, then this is the right place for you. Teesta and Ranjeet also intersect quite close to it. If you are a bird lover and you have an interest in birding photography the please just for you. And you could sit in the jungle and listen to the soft chirping of birds. Not only the Mt. Kanchenjunga but also the Teesta running the middle of the forest is a great view for photography lovers. Facing the Kalimpong hills Tinchuley is the latest secret eco-friendly tourist destination in Darjeeling. If you think about an offbeat tour plan then Tinchuley is the best holiday destination for you. On top, you are away from the crowd of typical hill towns. Tinchuley is a calm and quiet village offering the tranquility and nature and there are several great attractions, beautiful places, and nearby spots. 1. Watch the magnificent sunrise from Tinchuley View Point & snow peaks of Kanchenjunga & other Himalayan peaks when daylight breaks. 2. Walk for about 20 minutes through the forest of ferns and reach Gumbadara, another great viewpoint from where you see the river Rangeet a part of Sikkim. 3. Visit the lovely Orange Orchards of Nirmal's 8kms from Tinchuley. This family-owned property also has a factory producing fresh orange juice and pickles which you can buy. 4. Visit the Tinchuley Monastery. Here a Lama had meditated for 17 long years. 5. 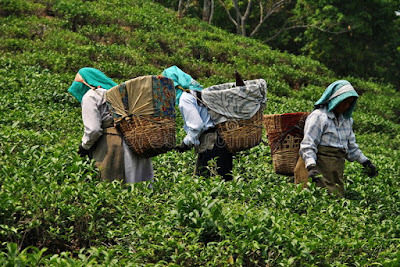 There are six tea gardens within short distances where you can experience the garden life, watch tea plucking, visit the factory and see tea processing. 6. The nearest tea estate is the well known Rungli Rungliot. Tinchuley is 32kms from Darjeeling 1.5 hours by car, 73kms from NJP 3 hours by car, 77kms from Bagdogra 3 to 4 hours by car and 35 km from Kalimpong about 2 hours by car. From Darjeeling you can get buses up to Takdah. from Siliguri Sevoke Road up to Takdah. From Takdah you will need to take a private taxi or Van for a short drive up to Tinchuley. Labels: Derjeeling, Tinchuley, Your ultimate holiday destination.